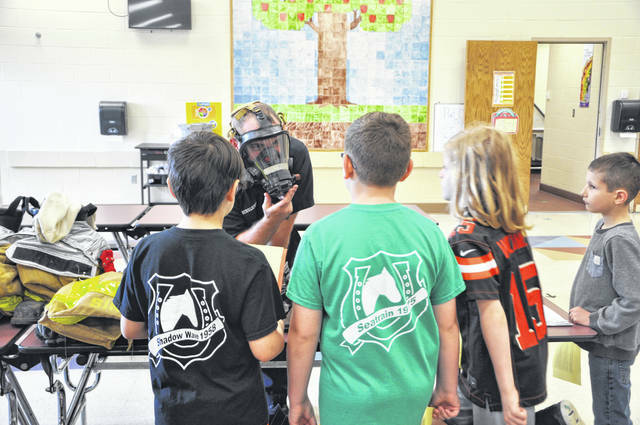 City of Columbus Firefighter Jason Singleton shows students his breathing mask and other equipment during the career fair at Schultz Elementary on Wednesday. 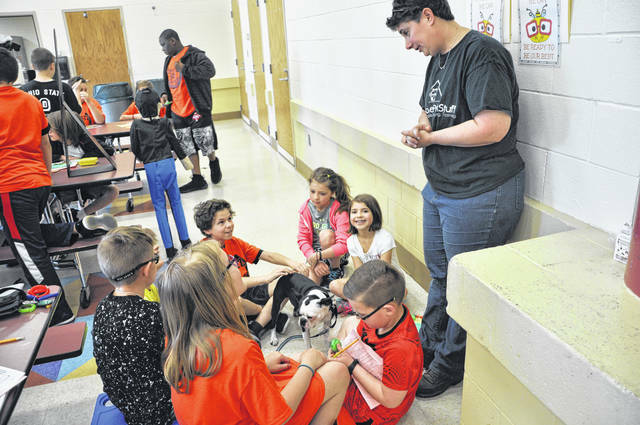 Delaware Pet Stuff owner Sherri Mitchell talks to students about taking care of pets, while students pet and play with Penny Pineapple, a dog Mitchell brought with her to Schultz Elementary’s career fair. Painters, prosecutors, and pet care experts were just a few of the professionals at Schultz Elementary School Wednesday to talk to fourth- and fifth-graders during a career fair. Schultz Guidance Counselor Sarah DeLong said she organized the career fair to give students a chance to ask adults questions about their jobs. More than a dozen local entrepreneurs, business people, or public servants attended the event and answered questions posed by students. “It’s important to bring the community into the school,” DeLong said. The questions included how the visitors got their jobs, what kind of training they did, and how much they enjoyed them. Fourth-grader Luke Helman said he enjoyed the career fair and guest speakers. “I liked learning about people’s jobs and learning new things,” he said. One of most popular guest speakers was City of Columbus Firefighter Jason Singleton, who showed students his equipment and talked to them about his training to become a firefighter. “It’s good to meet with kids and hear their questions,” Singleton said. He added students were fascinated by his bottled air and mask, and how long it lasts. “I want them to learn anyone can become a firefighter and overcome their fears,” Singleton said. Another popular speaker at the event was Penny Pineapple, a dog owned by Delaware Pet Stuff owner Sherri Mitchell. Mitchell said she and Penny taught students about training their pets by taking them to classes or daycare, and how important it is to groom their pets. During Mitchell’s presentation, students sat around and petted or played with Penny using different enrichment tools, which Mitchell said is important because it shows kids there are more ways to engage with a dog than just throwing a ball around. “I like the opportunity to teach kids things they can use at home,” Mitchell said. Mitchell joked that Penny was more wore out than she was after the two-hour career fair. DeLong said she believed the career fair went well and hoped students learned about careers they may want to pursue in the future. “I want them to know they can do anything they want (with their careers),” she said.